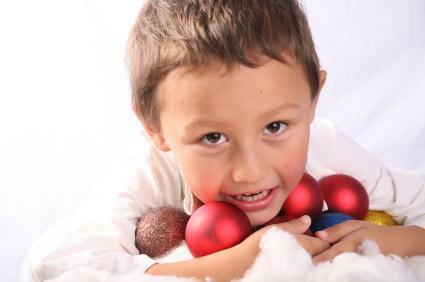 Having professional Christmas portraits taken is a yearly tradition for many families. However, for some, the thought of entering a crowded commercial portrait studio during the holiday season is a nightmare waiting to happen. To avoid a stressful, rushed experience, consider the following tips on how to handle a holiday sitting. When booking your sitting, consider your family's schedule. Avoid booking a sitting right before or after work, since traffic could delay your arrival and result in an unpleasant portrait sitting. Also, consider the age of your children. You shouldn't plan to get professional Christmas photos taken at mealtime or naptime. If you have a newborn, book your session for just after feeding times to avoid a cranky baby. You should also consider the number of people in the portrait. The more people you have at the photo session, the more time is needed to coordinate poses. Finally, Christmas is a busy season for many photographers, so being on time is sometimes not enough - arrive early if you can. This allows you to check-in, make any last minute adjustments to your hair and clothing, and allows you to field any potential disasters such as a fussy baby or wardrobe malfunctions. A great outfit can really add shine to your Christmas portraits. Whether you're inspired by images of your family in matching Santa hats or you've found the perfect outfit for your infant, the clothes make the portrait. Pick your outfits carefully, so that they don't clash with a desired portrait backdrop. When dressing a large group consider selecting a solid-colored top, such as red, white or brown. Neutral colors are best to use, especially if different members of your family are wearing different style tops. Likewise, stay away from big bold prints if you are posing with a number of other family members. You don't want to clash with the rest of the family, so consider toning it down for the portrait session, even if you typically wear loud clothing on a regular basis. backdrops are also important in professional Christmas portraits. Many photographers allow you to select your backgrounds ahead of time, as doing so helps save time on the day of your session. Ask your photographer what types of backdrops will best suit the number of subjects in your portrait. Finally, remember to consider your outfits when choosing a background. Select plain backgrounds for busy outfits, or you risk being in the center of an unflattering holiday photo. Make sure you have everything you need for your professional sitting. This includes all outfits, shoes, accessories, and personal items, such as hairspray and pantyhose. Emergency supplies such as baby wipes, stain remover sprays, hair ties and bobby pins should also be brought along. Finally, pack an anti-static dryer sheet in your bag. It can be rubbed on clothing or even swiped over hair to remove winter static.